TRAI Measures Bring Mobile VAS Activations Dwn By 60%! TRAI, in the month of July of this year came up with some strict measures and guidelines on how telecom operators activate and de-activate value added services to their mobile customers. This was done because telecom operators sometimes resorted to unscrupulous ways of adding VAS to their subscribers. It was a common occurrence where customer got subscribed to some or the other paid VAS services without their knowledge. They came to know about it only after they saw their bills, or their pre-paid balance was debited. The directive which was released in July laid down clear procedures on how telecom operators can activate or de-activate VAS for their subscribers. 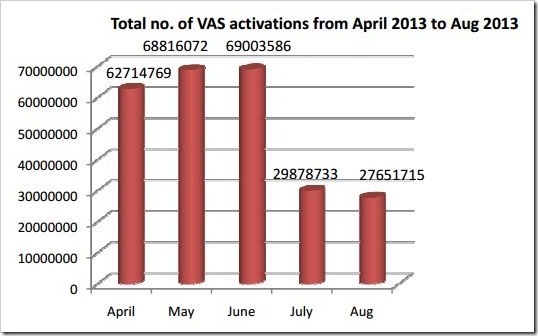 This directive has bought a significant downfall on VAS activations according to the numbers released by TRAI. The fall in number of activations was as much as 60 percent compared to months previous to the directive coming to effect. Take a look at the chart below released by TRAI. In the month of June, prior to the directive coming into force, a total of 69 million VAS activations were made, the figure immediately fell to 29.8 mln in July and fell further to 27.6 mln in August, only about 40 percent activations compared to June. Not only were activations has a significant drop, the complaints that were made in regards to activations also saw a steep fall. 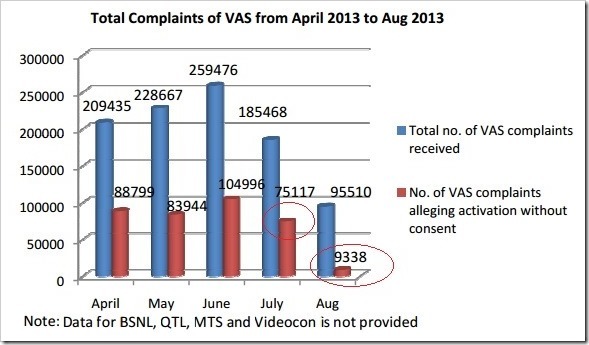 If you compare June and August, the total number of VAS complaints received fell to almost half, while the complaints alleging that VAS activation was done without consent fell by over 90 percent. Among the various steps taken, TRAI had made it mandatory for operator to implement a 2 step confirmation process for VAS activations and incase customer did not respond anything, it will be treated as “No Activation required”. Kudos to TRAI for taking the steps.